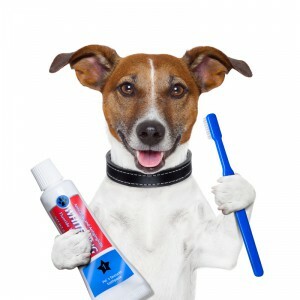 Brushing a dog’s teeth is an important part of your pet’s medical care. In fact, the tarter that you see slowly building up on your dog’s teeth is approximately 80% bacteria and has the potential to damage the gums, the bone beneath the gums, and the ligaments that hold the teeth in place. Furthermore, periodontal disease that goes untreated can lead to an array of problems ranging from bad breath to painful oral infections and possible spread of bacteria from the mouth to other organs. This, in turn, can lead to heart, liver, and kidney problems. It is recommended that you brush your dog’s teeth daily. But, if not, then at least 2 – 3 times per week should be sufficient. 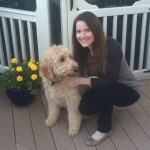 I am a loving and devoted dog owner who is highly attentive to my dog’s medical needs. So go ahead and ask me…do I brush my dog’s teeth daily, or at least the recommended 2 -3 times per week? No! I cannot tell a lie. And I know there are many loving dog owners out there that would report the same. Of course we love our dogs, but realistically speaking many people don’t even brush their own teeth as much as they should let alone their dog’s teeth. Let’s face it, life is busy, and if brushing your dog’s teeth was a requirement to dog ownership there would be a whole lot less dog owners in this world. So, am I saying that you can ignore all recommendations when it comes to the care of your dog’s teeth? Absolutely not. As it stands, by a time a dog is 3 or 4 years old, most already show signs of gum disease if they don’t receive proper mouth care, so it is very important! My husband is the dog-tooth-brusher in our household, and let me tell you he is not the most patient of people, so the job he does is minimal at best. If I had to estimate, our dog’s teeth probably get brushed about twice a month. But, if you do not brush your dog’s teeth as often as you should (or at all), there are still things that you can do to ensure your dog maintains a healthy set of choppers. Make sure your dog receives an annual check up with a veterinarian. Part of a routine vet check should be to check your dog’s teeth and gums. Be sure to ask if your dog’s teeth and gums look healthy and whether or not they need cleaning. If your veterinarian indicates that your dog needs his teeth cleaned, it is important that you heed the advice. Yes, so there it is, the consequence for not brushing your dog’s teeth is that you will need to adhere to your veterinarian’s advice should he/she instruct you to have your dog’s teeth professionally cleaned. Yes, it can be a bit costly, however, if you are like many dog owners, you may find this to be a very attractive trade-off. A healthy diet. Let’s face it, us people eat a lot of cavity causing foods, but our dogs don’t have to. So, keeping them eating a healthy diet will go a long way in keeping up a healthy mouth. Edible dental sticks: These have a unique texture that reduce plaque and tartar buildup and are specifically designed to promote oral health. Some even come with a toothpaste center. Dry dog food: The soft dog food is more likely to stick and sit on the teeth which can cause tooth decay. Traditionally, a professional teeth cleaning at your veterinarian’s office requires full anesthesia, which can make it a bit costly. Comparison shopping will be to your benefit as there is not one standard price across the board. Some factors that can make price fluctuate are things such as the size of your dog, the age of your dog, if deep cleaning is needed, if extractions are needed, the area you live in, etc. An alternative would be to seek out anesthesia-free teeth cleaning. Be forewarned though that some veterinarians will tell you that they do not recommend anesthesia-free teeth cleaning for dogs as they do not believe the results to be as satisfactory. Why wouldn’t the results be as satisfactory? Simply because your dog is awake and of course an awake dog may be anxious, squirmy, and overall just make it a little more difficult to be as detailed on the cleaning. However, since the cost is much lower without the anesthesia, and some dogs may not be capable of going under anesthesia due to medical issues, this could be a great second option. Read the product description prior to choosing a toothbrush as some are specially designed for small dogs, some for larger or long-snouted dogs, and some with bristles for a dog with sensitive teeth and gums such as senior dogs. There are many different flavored toothpastes, but most dogs seem to prefer the poultry flavored, so you may want to start with that. Some other flavors on the market are bacon, liver, mint, vanilla-mint, peanut, malt, beef, seafood (you might lose a few friends should you decide to borrow your dog’s toothpaste!). Remember, your dog will end up swallowing the toothpaste so do not use human toothpaste, since it contains detergents that should not be consumed and will irritate your dog’s stomach. Ideally, you want to begin brushing your dog’s teeth when he is a puppy. The sooner the routine is established, the easier it will be. If you are starting out with an adult dog, it may just take a bit of additional time to introduce the idea and get your dog to allow it. If you suspect your dog has mouth pain you should consult your vet prior to brushing your dog’s teeth. Untreated, painful teeth and gums will create a non-compliant dog when it comes to trying to brush. The best time to brush your dog’s teeth is when he is relaxed and does not have cooped up energy. After eating, and a walk, would be ideal. Gently introduce the toothbrush and toothpaste under the lip to get your dog used to it. If this is difficult, then just use a dab of the toothpaste on your finger and rub it on your dog’s lips for as long as he will allow. You can do this daily for a few weeks if needed, or until your dog becomes more comfortable with the idea. If your dog does not enjoy the taste of the toothpaste, try a different flavor. If your dog finds the taste desirable, he will be more compliant. Move on to gently brush a tooth or two, whatever your dog will allow. You can lift your dog’s lip as needed. Once your dog starts getting the hang of the tooth brushing process move on to brushing all of the teeth, working on 3 or 4 teeth at a time, then moving on to the next. Teeth should be brushed in a circular motion with the bristles placed at a 45-degree angle to the teeth. If you are not able to do a circular motion, a back and forth motion will be sufficient to help remove the plaque. Be sure to get along the gum line. If your dog resists, keep in mind that the most important teeth to brush are the outer teeth that touch the cheek. These are the ones that accumulate the most tartar so if you have to pick and choose these would be the ones to go for. Remember to always stay calm and relaxed in order to keep your dog in a calm, relaxed state as well. Some dogs can actually grow to enjoy getting their teeth brushed, after all it is a form of attention from their owner, and there is the great taste of the toothpaste to enjoy! this is great informative reading material . I have had different dogs over the last thirty years, and I never brushed their teeth. I did give them hard chew bones that was suppose to help remove tartur and junk. But I guess brushing a dogs teeth is more in the new age of information. I do not have a dog at the present time but I will have to make the attempt on the next pooch I do take in. I think starting at a young age would benefit the comfort process for both owner and dog. Hi Angela, thanks for your comment!